Why do I care? When planting crops or plants, soil density is very important. If the soil is packed too tightly, the plant or crop won't be able to absorb any water or nutrients from the soil and will not be able to grow properly. Density in the atmosphere is also important in the formation of clouds and precipitation. The technical definition of density is mass per unit volume. Generally, density describes how tightly packed something is. An object with a lot of material in a small space is more dense than an object that has lots of air space included. In the atmosphere, gas that is less dense has a lower concentration of molecules per volume than a denser gas and will tend to rise compared to the air around it. For example, gasoline vapor is heavier than air molecules and so tends to stay near the ground when you fill up your gas tank, which can lead to a fire hazard if the lingering vapor encounters a spark. Warm air is less dense than cooler air. Air density varies with the relative humidity (amount of water vapor molecules in the air) along with temperature. Water vapor molecules (H2O in the gaseous phase) are composed of Hydrogen (H) and Oxygen (O) molecules. Hydrogen has a molecular weight of 1.01 g/mol. Dry air is composed mostly of Nitrogen (N) molecules since Earth's atmosphere is 78% Nitrogen and 21% Oxygen. Nitrogen has a molecular weight of 14.0 g/mol. In the atmosphere, the density of air particles decreases with height, with more gas particles remaining near the surface of Earth. When only taking into account humidity, dry air is more dense than moist air because of molecular weights of the gases. Figure B. Hot air balloons. Note that gases, such as hydrogen and nitrogen, do have weights, but the weight cannot be felt just by moving through the air. Special equipment and procedures are used to measure the weights of gases. When only considering the temperature of air, which does not all heat up at the same rate, dry warm air tends to rise compared to areas of cool air around it. You can notice the effects of this if you live in a two-story house as the upstairs tends to be warmer than the downstairs. Areas of warm rising air often result in the development of clouds and even precipitation in the regions where the vertical movement of air is strongest. A hot air balloon is a good example of how people work with density (Figure B). 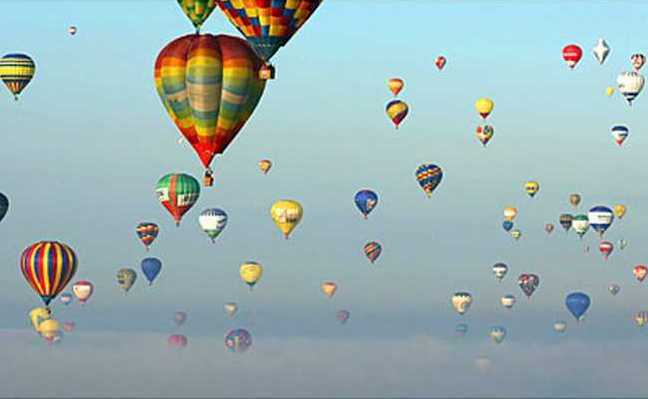 Hot air balloons use the properties of density in order to float. In the base of the hot air balloon, there is a torch that heats up the air inside of the balloon. When the air inside the balloon becomes warmer than the surrounding air, the balloon will begin to float. The person controlling the hot air balloon can add more heat to the balloon to reach the desired height. The air inside the balloon needs to cool in order for the balloon to land. Density can be used to explain variations in soil textures. Think of the three main types of soil particles: sand, silt and clay. To help you imagine the size of each of these types of particles, imagine that each particle of sand is the size of a bowling ball, each particle of clay is the size of a baseball, and each particle of silt is the size of a marble. Now imagine that a swimming pool is filled with only sand (bowling balls) and try to picture how many of those bowling balls it would take to fill the whole swimming pool. Then, think about the space around each bowling ball, and imagine that the space is filled with air. That pool is not very dense, because there are lots of air pockets. Now, imagine that you fill the spaces in between each bowling ball with clay (baseballs). Your swimming pool just got a bit denser, with fewer spaces for air. Now, if you fill in the remaining spaces with silt (marbles) there should be very few spaces left that are filled with air. This last kind of soil is the most dense. Soil that is very dense and has few air pockets has become this way through compaction. Compaction makes it harder for water and air to penetrate the soil around the roots of your crop, which makes it hard for the plants to grow. Compacted soil results in less root growth, because it creates a barrier that makes it difficult for roots to have access to oxygen, water, and nutrients from the soil. On the other hand, compacted soil is a good thing when it comes to things like building roads or buildings. Construction engineers work very hard to compact soil in order to lend stability to structures. 7th grade science: 7.E.1.1 : Compare the composition, properties and structure of Earth's atmosphere to include mixtures of gases and differences in temperature and pressure within layers.